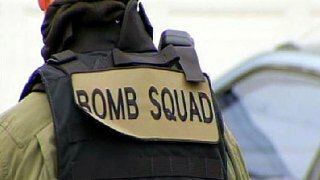 Police said a bomb squad safely disposed of a possible live grenade Sunday evening near the Benicia Capitol building. A youth found the grenade at about 5:10 p.m. in some water at the bottom of First Street. The grenade still had its pin intact. Police cordoned off the area around First Street between G and H streets. Police said businesses were told to lock their doors and allow their customers to go out of a back exit as a precaution. Officers made sure no one was home in the affected area. When the youth found the grenade it was covered in barnacles and he took it to show his father, who was in the area of First and H streets and called police.